The Zeta Tau Chapter of Alpha Epsilon Pi has been on the campus of the University of California, Irvine since 1986. Zeta Tau received its charter on May 22, 1988 and joined UC Irvine’s Interfraternity Council on April 2, 1990. Our Chapter membership is consistently between 35 to 40 brothers each year. While some houses aim for high numbers, we consider our moderate size to be a great strength. It allows a strong brotherhood to flourish in AEPi because we know each other very well. We are able to develop much more meaningful friendships with 35-40 tightly knit brothers than we could with 100 acquaintances. No other house can offer the brotherhood that Alpha Epsilon Pi has. AEPi ZT has been a very active participant in the UCI community. The presidents of Hillel and Anteaters for Israel are currently brothers of AEPi. We have had brothers participating in ASUCI, the Interfraternity Council, the New University, the UCI Cheerleading Squad, the UCI Hockey Team, the UCI Track Team and many other extracurricular activities. We have won numerous Greek Awards in recent years for community service, sportsmanship, and academics. Brother Sasha Strauss also won the esteemed Greek Man of the Year award a few years back. Also, ZT consistently ranks at the top of all UCI fraternities in GPA. Our involvement extends beyond the UC Irvine campus. We have contributed to multiple charities in the past including Cuck Fancer, school year. We are very active in every facet of student life and are getting stronger each year. To find out more about becoming a brother of Alpha Epsilon Pi please visit our Rush page. In the history of the United States, 1913 was an eventful year. Only a year before, Arizona had been admitted to the Union as the forty-eighth state, completing the continental bounds of the country. Woodrow Wilson was inaugurated president, the Federal Reserve System was established to strengthen the banking system; and the Sixteenth Amendment to the Constitution was adopted, providing for the progressive tax on income. The Panama Canal, one of the greatest engineering feats of modern times, was nearing completion and would be in operation in 1914. In that same year, at the School of Commerce of New York University, Alpha Epsilon Pi officially made its appearance in the fraternity world. There have been rumors that preliminary organization may have taken place as early as 1911. This seems unlikely. However, it is fairly certain that the work of establishing a new fraternity at New York University began in the 1912 – 1913 academic year. Founder Charles C. Moskowitz, speaking at a banquet in his honor on November 13, 1952, indicated that the winter of 1913 was the time when organizational activity got into high gear. It appears certain, therefore, that by late 1912 or early 1913 the founding of the new fraternity was well under way. Its founders were all young men of serious purpose, employed during the day, coming from middle class homes, who sought to get ahead by obtaining the formal training offered at New York University in the evening sessions. The catalyst for the founding of Alpha Epsilon Pi was the transfer of Charles C. Moskowitz from the College of the City of New York to New York University’s School of Commerce. While enrolling at C.C.N.Y., Charles Moskowitz, a fine basketball player, was heavily sought after for his athletic skills. When he enrolled at New York University, his reputation had preceded him, and he was immediately rushed and given a bid by one of the fraternities. Which fraternity is not known, and nothing exists to indicate its name. It is known that in 1913 the following fraternities were in existence at the School of Commerce: Alpha Kappa Psi, founded in 1905, and today one of the leading professional commerce fraternities; Delta Sigma Pi, founded in 1907, and today Alpha Kappa Psi’s chief rival; Lambda Sigma Phi, a local, founding date unknown; Phi Sigma Pi, a local founded in 1911; Phi Delta, a local, founded in 1912; Phi Sigma Delta, a predominantly Jewish group, founded at Columbia in 1910, which had placed its Delta chapter at NYU’s School of Commerce in 1913; and Phi Delta Sigma, a local, founded in 1913. One of these seven fraternities rushed the young basketball star intensely. However, when Charles Moskowitz asked whether bids could also be extended to his friends, he was immediately told that the bid was for him alone. Brother Moskowitz had a circle of close Jewish friends that met after work for dinner before going to class. Evidently, Founder Moskowitz discussed this with his friends and they decided that fraternities were good for the students. Since there was no patent on the idea, they would start one of their own. The group had its meals at a German rathskeller on Second Avenue, within walking distance of the university. The specialty was frankfurters and sauerkraut, and the price was fifteen cents. The basement was open to the public only in the evenings when business was especially brisk. The young students talked with the owner who agreed that if six or eight men would eat there regularly every school night, he would give them a private area in the rathskeller. And that is how Alpha Epsilon Pi began. By common consent, the name Alpha Epsilon Pi had been chosen as best representing the ideals the founders wanted to express. Coincidentally, just four years earlier, a Jewish sorority had formed at Barnard College, a college for women related to Columbia University, and had chosen for itself the name Alpha Epsilon Phi. An even more remarkable coincidence, for coincidence it seems to have been, is that the badges of the two organizations were very similar. In both the three Greek letters are horizontally attached, and the only major difference is that there is a bar through the letters of the women’s group. Research has failed to discover any link between the two groups, although it is assumed both used the same fraternal jeweler. It now appears that the young men at New York University who founded Alpha Epsilon Pi were completely unaware of the existence of Alpha Epsilon Phi. After months of meetings and perfecting the organization, the young group decided it was time to obtain recognition from the university as an official School of Commerce fraternity. To gain recognition, it was decided to address a letter to Dean Joseph French Johnson of the School of Commerce, outlining the aims and ideals of the fledgling fraternity and asking for his consideration and approval. David K. Schafer was the only member who could type, so he, as secretary, was chosen to draft the request and type it, to give it a businesslike appearance. The letter was submitted, probably about early October, after which the waiting period began. As is the case today, the wheels of the decision makers turned slowly. At last, however, the long awaited reply came on November 7, 1913. It was in the affirmative. Alpha Epsilon Pi was a recognized fraternity at New York University. It has already been stated that Founder Charles C. Moskowitz was an outstanding basketball player, playing on the Commerce team for three years and managing it for one of those years. Charles J. Pintel was a publications man. He was circulation manager of both the Commerce Record and the Washington Square Dealer, the downtown campus newspaper. The staff of the Commerce Record, a weekly paper devoted to the activities of that school and its students, listed Brothers Lustgarten, Shulman, and Kraus as staff members. Founder Herman L. Kraus was a debater and helped the N.Y.U. Commerce team achieve victory in a debate over the Wharton School team of the University of Pennsylvania. He served as secretary of the Commerce debating society, of which founders Lustgarten and Shulman were also members. In voting for class personalities in the 1914 class, Brother Moskowitz ranked third for best athlete; Brother Shulman second for class beauty; as well as second for best natured. Founder Kraus was also a member of the advertising staff of the Violet, a member of the Triad League, an advertising society and editor for the Menorah Society, while Founder Shulman was the class historian. Of the five pledges, Samuel Epstein was a member of the debating society and of Delta Mu Delta, the honorary scholastic fraternity. Morton I. Davis was already working as an accountant and became a very successful CPA heading up a very prominent firm. Aaron Rubin became a very successful investor and one of the great names in Alpha Epsilon Pi. Sidney Picker was also destined to make his mark in the fraternity, as he did at Commerce, where he was on the Executive Committee of the Class of 1915 and vice president of the Debating Society. Later that year Henry Rosenblum appears to have been added, and he became a successful CPA and attorney. Very little is known about Nathan Katz. 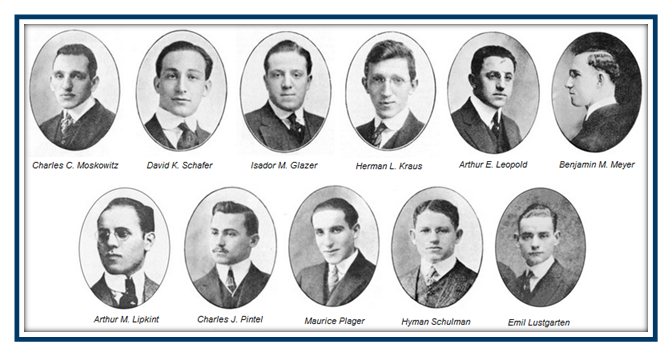 In 1914, the following men graduated, leaving the fraternity with a nucleus of eight men to carry on: Morton Davis, Samuel Epstein, Nathan Katz, Benjamin Meyer, Charles Moskowitz, Charles Pintel, Maurice Plager, and Hyman Shulman. Weaker men might have faltered at this mass exodus that included many of the leaders and founders of the fraternity. This was not the case with the men of Alpha Epsilon Pi. Although the treasury was quite small, Founder Schafer recalled later that dues were fifty cents a month, the men pressed ahead with what had been their goal from the outset, the founding of a new national fraternity. Plans toward this end had actually started when the fraternity was first organized, and the Violet carries the designation “Alpha chapter” with the listing of members in the very first edition (1915) where Alpha Epsilon Pi is included. A young law student, unfortunately nameless, agreed to draft articles of incorporation for Alpha Epsilon Pi Fraternity, Inc., under the Act of the Legislature of the State of New York, Chapter 40, Laws 1909, entitled “An Act Relating to Membership Corporations.” Evidently, the founders were most impressed with the organization and growth of Alpha Kappa Psi and Delta Sigma Pi, which limited their membership to students in the Schools of Commerce of the universities where their chapters were placed, and decided to emulate them. Contact was soon made with a group of men at Cornell University who had organized a local fraternity there called Phi Tau. They and the brothers at NYU had a meeting of the minds and formed the Beta Chapter of Alpha Epsilon Pi. Truly, Alpha Epsilon Pi could now be called a national fraternity. A new national fraternity, probably the only major social fraternity in existence today for undergraduate men that was founded in night school, had come into being, less than one year after its official recognition by Dean Johnson of New York University. It must be taken into consideration that Alpha Epsilon Pi was a World War I baby. Counting the Beta Chapter only fifty-two men had been initiated by April 6, 1917, the date the United States formally declared war on Germany and her allies. Almost every undergraduate and alumnus answered the call of the colors causing the fraternity to become nearly inactive during the war years. The fraternity would have easily disappeared, like so many other locals, if not for the efforts of brothers Theodore Racoosin and F. Nathan Wolf who shouldered the burden of keeping the fraternity alive and planning for the future. Reidentifying with its Jewish heritage, the men of Alpha Epsilon Pi refused to say die. Possessed with faith and courage to believe that this too would pass, they were determined that the national strength could be regained, and that the fraternity would once again be able to pursue its mission of shaping young Jewish men into community leaders. It has been over ninety years since Alpha Epsilon Pi began to build its special form of brotherhood. The fraternity has survived four wars, the great depression, several recessions, changes in the standards of morality, and a revolution in personal behavior and conduct. It has seen more changes occur in this time than had occurred in the entire history of the world prior to its founding. It has seen the birth of television, the jet plane, space travel and the computer. Through it all, the fraternity has remained true to the ideals of the founders honesty, courage, brotherhood, love of country and faith in Jewish ethics and values. If these ideals continue to have meanings in the years to come, then Alpha Epsilon Pi will be able to carry its message to college generations yet unborn. It will have been true to the ideals expressed in the motto emblazoned on its coat of arms, ESPONDA. Recently, Alpha Epsilon Pi celebrated its 93rd Anniversary, with over 132 chapters on its chapter roll. Its membership directory boasted over eighty thousand members. The greatness Alpha Epsilon Pi has achieved is all from the vision of that group of eleven young Jewish men going to night school in pursuit of a better life. Many times a chapter will blame its lack of success in part because of low membership. But one thing that every brother should learn from our history is that Alpha Epsilon Pi started with eleven men, ended the first year with eight due to graduation, and flourished into the fraternity it is today. It is not the numbers that make us great, it is the spirit and motivation to create something unique and the ability to implement a positive program based on Jewish ethics and values.